Kolombangara from Kula Gulf at the entrance to Hathorn Sound. Clipper Odyssey weighed anchor at first light and set course east in Blackett Strait toward Kula Gulf. Over the next hour, we watched the sun rise before detouring into Ringgi Cove, largest of five coves on Kolombangara’s south shore, and marveled at the dramatically different barrier island-and-lagoon geology of Arundel Island to starboard. The sun had climbed into the sky by the time we arrived at the site of Lever Bros.’ coconut plantation at Vila, the strait’s narrowest point, little more than 1/2 mile wide. Passing into Kula Gulf, we crossed the mouth of Hathorn Sound, then stopped off Bairoko Harbor to put our Zodiacs over the side. Inside the harbor we investigated a wrecked freighter, then motored up the shore to Enogai Inlet, were we saw two guns of a four-gun battery that fired on Strong as she was sinking not far offshore, 5 July 1943. It was hot, so we were glad when Chef Jeff came out in his own Zodiac to serve us ice cream before we reembarked on the ship and sailed back through Blackett Strait. Crossing the head of Vella Gulf, we went ashore again in the Zodiacs in the afternoon at Vella Lavella, this time to visit the Barakoma airstrip from which “Pappy” Boyington’s Black Sheep Squadron once flew. 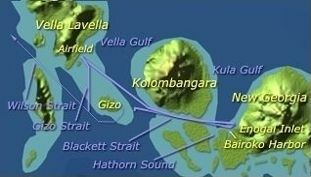 Then, dropping our immigration and customs officials and a guide at Gizo, we headed northwest through Wilson Strait, destination Bougainville.